Explanation: Combined image data from the massive, ground-based VISTA telescope and the Hubble Space Telescope was used to create this wide perspective of the interstellar landscape surrounding the famous Horsehead Nebula. Captured at near-infrared wavelengths, the region's dusty molecular cloud sprawls across the scene that covers an angle about two-thirds the size of the Full Moon on the sky. 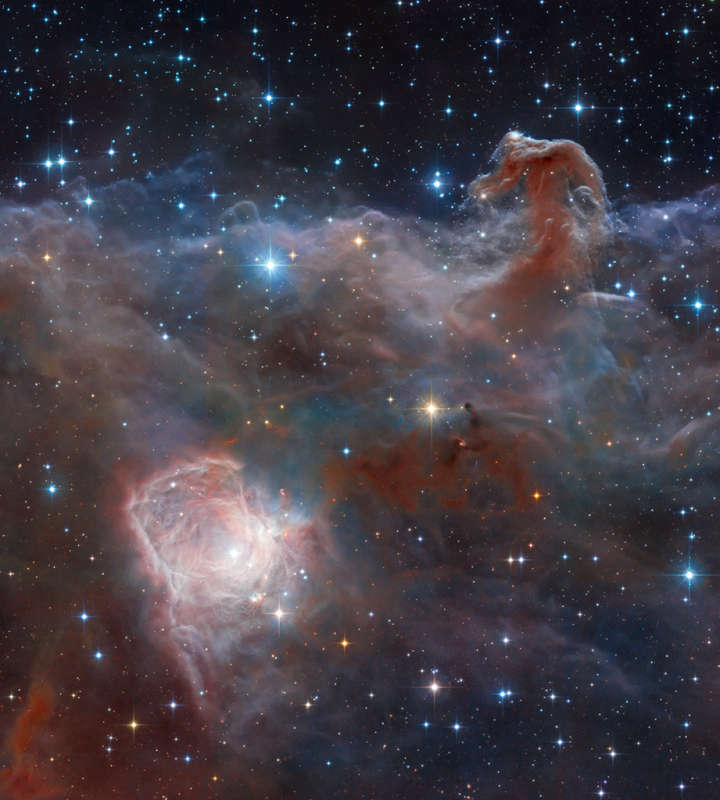 Left to right the frame spans just over 10 light-years at the Horsehead's estimated distance of 1,600 light-years. Also known as Barnard 33, the still recognizable Horsehead Nebula stands at the upper right, the near-infrared glow of a dusty pillar topped with newborn stars. Below and left, the bright reflection nebula NGC 2023 is itself the illuminated environs of a hot young star. Obscuring clouds below the base of the Horsehead and on the outskirts of NGC 2023 show the tell-tale far red emission of energetic jets, known as Herbig-Haro objects, also associated with newborn stars.